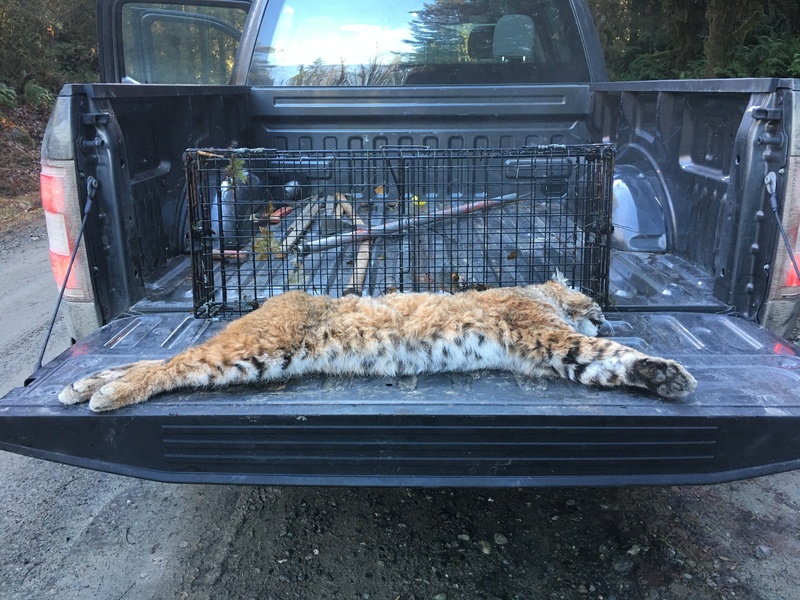 It never ceases to amaze us when trappers send us photos of their successes catching large bobcats with relatively small wire triggered Comstock cage traps. 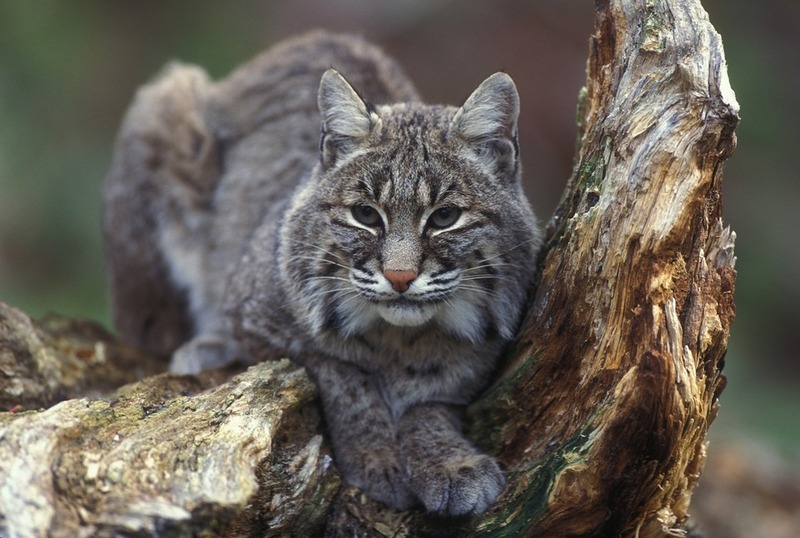 Most trappers, including us, are more comfortable using and recommending taller traps, 18, 21 and 24 inches for bobcats. To be on the “safe” side we have promoted tall traps, which may still be correct generally speaking. However, recently we received two photos that make us scratch our heads and perhaps rethink what seemed to be absolutes. First, a trapper in Connecticut had us build him a pair of fisher traps, 9x9x40, with angled powered ring lock doors. Fine for fisher, these traps would seem a bit small or more like way to small for a bobcat. This past week he caught a 21 pound female bobcat in the very same 9×9 trap. In the end the bobcat received a radio tracking collar from the state. Just two days ago a Washington trapper sent photos of a monster bobcat weighing in at a whomping 38 pounds. We had shipped him a couple of sets of 4, nested, double powered bifold door cage traps 15, 18, 21 and 24 inches tall in widths of 7.5, 9, 10.5, and 12 inches. Fearing that the 15 inch tall traps were on the small side for bobcats, we didn’t recommended them and only made a few. It was a real surprise to find that the smallest 7.5×15 inch trap had taken the largest bobcat we had heard of being caught in the bifold’s. There was also a Maine trapper who last year caught a nice bobcat in a 12x12x36 Comstock double powered door cage trap, not really a big trap for a tall bobcat. In each case the overall opening was not large, in fact smaller than the outside opening when the door is taken into consideration. The 15 inch trap has just 13.5 inches of clearance, while the 12×12 is only 10.5 inches high at the opening. Most incredible, the 9×9 is a meager 8 inches tall inside! It should be noted that if the 12×12 trap is set sideways so that the door closes from the side, with the trigger on top or bottom, the trap is a full 12 inches high. I guess the lesson in all this is though a tall trap may be the better choice, if you only have a short trap to set, its still worth setting and don’t be surprised if you find bobcat staring back at you. I have never had a bad experience with your traps Jim, always confident after I set and always producing. I have to pick up some of these cat cages to go with all the rest of my CCC’s. Thank you ! Here is the Medium and Large Double Door Bi-Fold Bobcat Trap “Nested” inside a XL Double Door Bi-Fold Bobcat Trap. The leader in humane, live, cage traps, Comstock combines the most advanced traps and accessories with the most advanced methods in a system of baitless trapping that can turn even a "first timer" into a "pro". Comstock Custom Cage, LLC shared a post.
" Thanks very much for our conversation about my lake beaver job on the phone last week and the quick shipping of the beaver trap. As luck would have it I got the beaver on camera hitting my castor mound two nights ago. So yesterday set the cage in the manner you described the other couple of trappers using with success; the castor mound made top center of trap. And this morning he was caught, worked like a charm! I attached some pictures for you. Have a good one! "